Even in my last few days in Chicago, I was still making new discoveries. 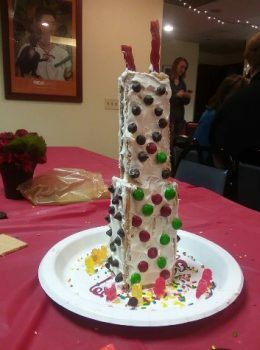 My gingerbread team made a fantastic replica of the John Hancock building at the CS Christmas party, for one. But yesterday, I discovered for the first time that Canterbury Apartments has a back alley. I also discovered that the employees there are super great at helping people bring their possessions out to their vehicles. I fooled said employee into thinking I was great at parallel parking and made a new friend along the way. Out of habit, I found myself saying, “See you later,” as I pulled away. And I found myself wishing it was true. There are so many great people that I didn’t get to meet—Chicago is an endless supply of newness and discovery. My drive out of town brought me south of Gold Coast, cruising past all the familiar sights and stores and roads I had walked past countless times. Driving makes me sentimental, and I realized that I really will miss the Chicago—the city that now feels like home, and all the things that come with it. I’ll miss the skyline. I’ll miss taking a walk, and then looking up and seeing another whole landscape. I’ll miss seeing the lights come on around Millennium Park. The smells wafting out of Garrett’s Popcorn. I’ll miss all the friends I’ve made here, whether they’re coworkers, classmates, or waiters at Pizano’s. But some things I’ll be taking with me: Skills learned at my internship. Great memories. The confidence that comes from navigating on my own. Impeccable taste in deep dish pizza. 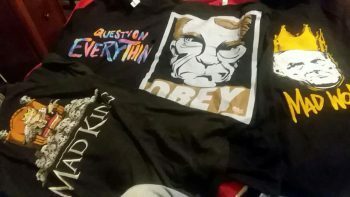 And a bunch of free t-shirts from work. Love ya, Illinois Policy. A piece of Chicago with stay with me wherever I go, and I know a piece of my heart will always stay in Chicago. I’ve loved my time with Chicago Semester, and I’ll always be grateful for the opportunities I was given. But it’s time for other adventures: I’m off to finish my last semester of college and start a new job. Even though I won’t be in the city of Chicago, there’s more learning to be done and new friends to be made.